Christmas, slightly simplified… | Pursuing "enough"
It is Christmas. We have an almost-eight-month-old. It’s a bad combination. As we started decorating for Christmas this year, I forced myself to scale back. Partly because of the knowledge that the baby could start crawling at any moment, and how much time do I really want to spend chasing a baby? Also, though, because of the hassle. Isn’t that awful? To look at these things as a hassle? But when I pulled out the lights we usually hang with our garland on our porch, and half were burned out, I didn’t even bother. I just piled everything back in the box and thought maybe next year. The tree is up. The Nativity scene is up. The Advent calendar is up. The wreath on the door is up. I checked in with my oldest as I was reigning it in, and asked if there was anything else he Really Wanted to put up; if there was anything he would Truly Miss if it wasn’t out. Verdict: the light-up houses. So we set up our seven little Dickens’ Village houses on top of the piano and I put them on a timer so I didn’t even have to turn them on in the morning. Then I put my red glass hurricane candleholder on the kitchen island and called it good. I made it a full week before I decided I really wanted the garland hanging on our stair banister. Maybe it’s just that I’ve gotten used to it; it’s been with us through the last two houses. That’s almost ten years worth of greenery hung with red tartan plaid ribbons. Now we’re driving through neighborhoods looking at Christmas lights, and I’m feeling like a Scrooge. We usually have candles in all our front windows, and I hang a little greenery with white lights on our small front porch. 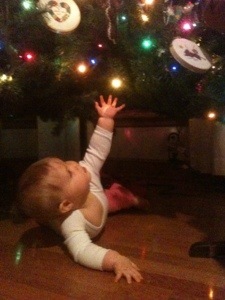 The practical side of me is screaming, she’s going to start crawling! You don’t want to have to watch all those cords! You don’t want to have to deal with burnt out bulbs! But guess what? I really, really miss our lights. A wreath on the door just doesn’t cut it. And honestly, if you’re going to have anything on display at Christmas, shouldn’t it be lights? Yes….even if you’re going to have a scaled-down Christmas, you should probably keep the lights.